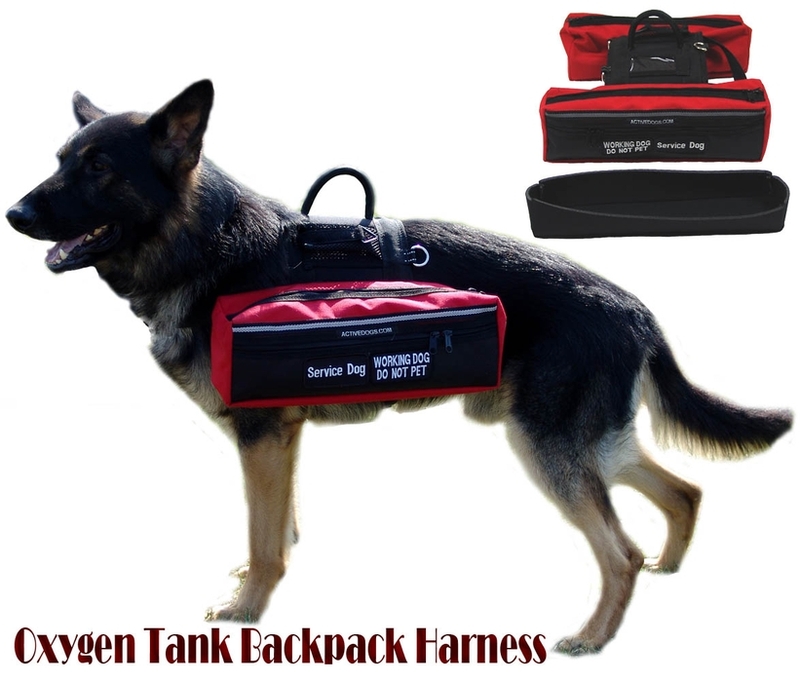 If you need to have portable oxygen with you this Oxygen Tank Backpack Harness is a must for you and your service dog. The Oxygen Tank Backpack Harness has a specific use as a carrier for oxygen cylinders. It features many functional elements as a backpack and dual purpose of being an Identification service dog vest. We have designed this working Oxygen carrying backpack with padding underneath the back plate that goes on the dog's back to give cushion comfort for the dog while carrying the oxygen cylinders. The tank bags have removable padded cradles that hold the cylinder tanks secure. The bags have dual zipper heads so you can open the bags from either direction. On the outer area of the bags there are two additional pockets for extra storage, they also have dual zipper heads. 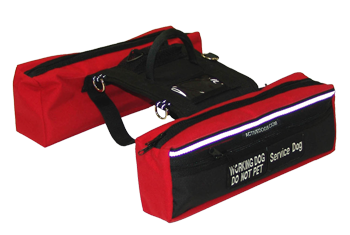 The bag size is approximately 5.5" x 16" & 6" deep, this will accommodate a standard M9 or smaller portable oxygen cylinder (with regulator attached). On the top of the backpacks there is a stand-up easy grip handle, cell phone carrier, and a clear ID pocket. There are a total of three D-rings for attaching leashes or bridge handle. There are two girth straps so the tanks don't flop around, they are adjustable. The front chest strap is adjustable and has a buckle. Both sides have safety reflective webbing on them. This Backpack will fit a girth measurement of 30"-38". This Oxygen Tank Backpack Harness comes in black, red or yellow color.